The first time you run Art Authority for iPad, you have the option of viewing an Intro show which has some basic information about the product. To exit this show, tap the exit arrow at the top left of the screen. This will put you in the main room of the gallery. The simplest way to enjoy art in Art Authority is to use Shuffle Mode. In the main room, tap Directory and then Shuffle all artists. This brings up an endless random show of works from all artists across all periods and movements. There are similar shuffle mode shows for each period. 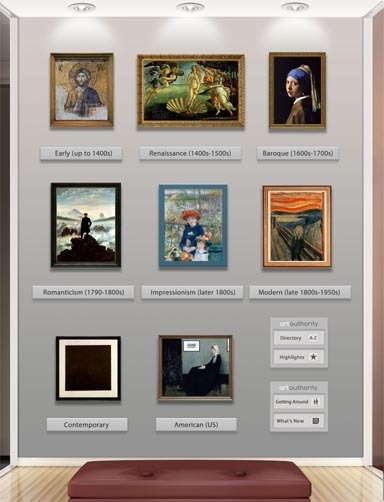 To see works of artists from a sub-period, tap the sub-period. A popover appears, with a list of all artists from the sub-period. Note that shows that have been previously viewed are marked with a white check mark. Tapping an artist takes you to the artist's page in Wall View. We'll discuss Slide View shortly. The first work is displayed in the center of the window. A plaque at the top of the window displays the artist's name, period and sub-period. The artist's name is a tappable link to more information about the artist. A plaque at the bottom shows the work's title and -- if known -- date, medium, dimensions and location. The title and location may be tappable links to more information. All images are shown in a "film strip" down the right side. If the film strip extends below the bottom of the window, you can move it up and down by flicking up and down. Single-tapping any image in the film strip takes you to that image, still in Wall Mode. Tap above the film strip at any time to scroll it back to the first image. Double-tapping any image in the film strip, or double-tapping the image itself, displays that image in Slide Mode. 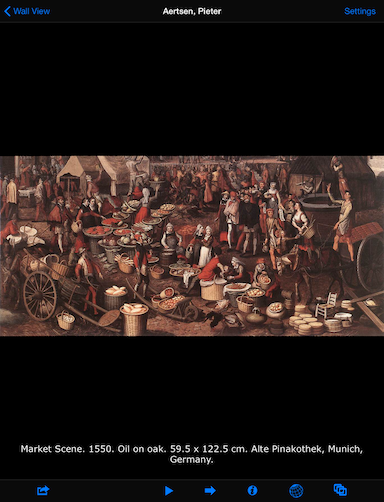 Flicking left or right on the central image takes you to the next or previous image, as does tapping on the far left or right side of the screen. You can push the menu up out of the way, or get it back, using the tab at the bottom of it. Tap the icon to watch the video. Art Authority for iPad has a full-screen slideshow mode. You enter this mode from Wall View by double-tapping either the main image or an image in the film strip. From Wall View - with the menu pulled down, tap Grid View. From Slide View - tap the thumbnail grid icon in the navigation bar. Tapping on any thumbnail will take you to a Slide View of that image. A red box around an image indicates the image that was displayed when the show last went to grid view. If you tap-and-hold a thumbnail image, summary information for that work will appear in a popover. The number of thumbnails per row can be changed by tapping the Columns button at the top right of the thumbnail display. You can search among thumbnails by tapping the magnifying glass at the upper left, which brings up a text box and keyboard. The thumbnails will be limited to those whose captions contain the text you enter. A work's dimensions, if known, are displayed as text (e.g. "59.5 x 122.5 cm") in the lower plaque in Wall View, and in the caption in Slide View. Art Real Size gives a sense of a work's size in a visual, immediate and intuitive way, by displaying an image of a couple next to the work. You get to Art Real Size by tapping on an image in Wall View, or by tapping Art Real Size in the menu in Wall View. 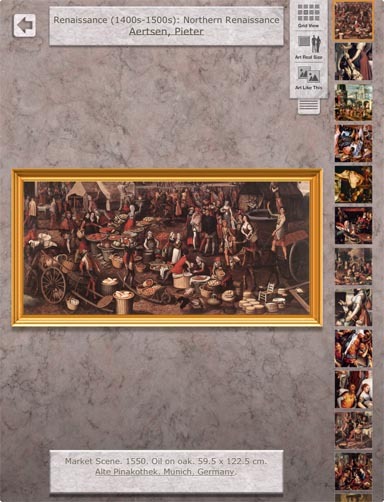 While viewing Art Real Size, you can flick left or right, or tap the left or right side of the screen, to move between images. You can also double-tap for Slide View. 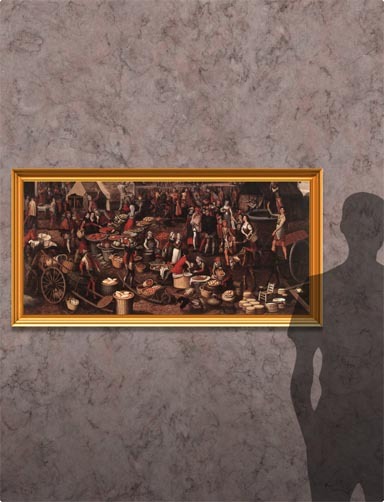 To get out of Art Real Size, tap once on the current image; you will be returned to Wall Mode. You can ask to see works that are similar to the work currently displayed. From Wall View, tap Art Like This in the pulldown menu. A show appears, with the current work first, then works in descending order of similarity. 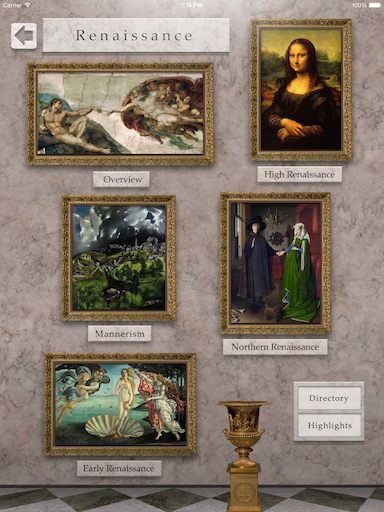 Tapping on Directory in the main room or any major room (like "Renaissance") brings up the search popover. 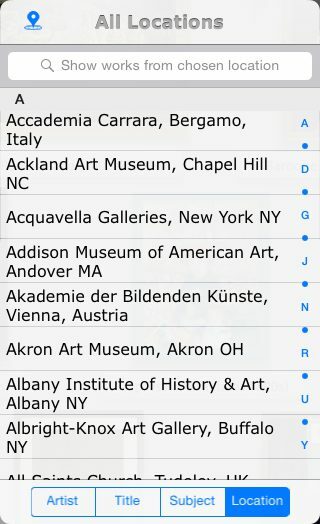 Select the type of search -- by artist name, title, subject or location -- using the buttons at the bottom of the popover. Each search type presents a list of search terms. 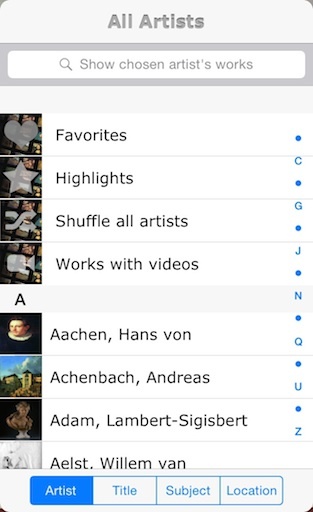 For searching by artist name, subject, or location, tap on an item in the list to search for that item. Entering text (tap in the text input box and type from the keyboard that pops up) reduces the size of the list. Searching by title is different. For search by title, you can tap on an item in the list, or enter text in the text input box and then tap Search in the keyboard. In the latter case, Art Authority searches for works whose title contains the phrase you entered. and then tap the arrow in the upper left corner of the search popover. You can change a search option by tapping it in the search popover and selecting a new value. When you have the options you want, tap Show. Works are displayed in ascending order of their distance from your current location. Tap the underlined title in the top plaque to display a map around your current location. and then enter the location, such as "Seattle". A results list is shown as you type, filtered by what you've entered. 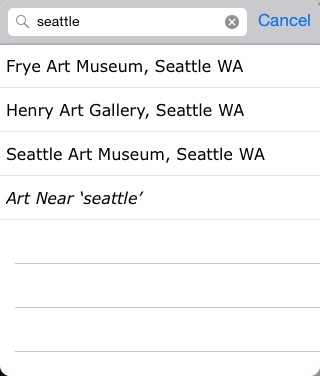 From here, you can tap the name of a gallery to get works at that gallery, or tap Art Near 'seattle', and then Show, to get works near Seattle. 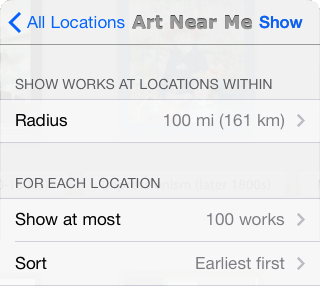 You can fine tune Art Near Here shows by using the same search options as you do for Art Near Me. 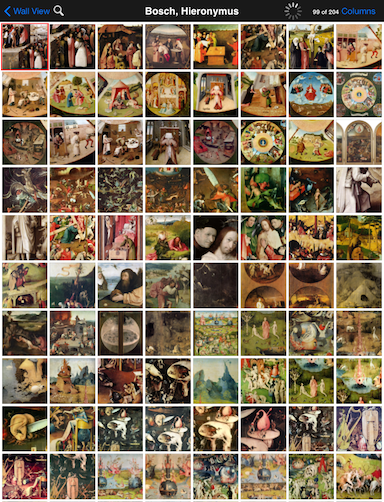 You can maintain and view a list of favorite images. To add an image to Favorites, view the image in slide view, tap the globe icon, then Save Image to Favorites. To view Favorites, tap Favorites in the search screen described above. To delete an image from Favorites, run the Favorites show in slide view. When you're viewing the image you want to delete, tap the gear icon and then Delete Image. You can see highlights from all major periods by tapping Highlights in the search screen described above. 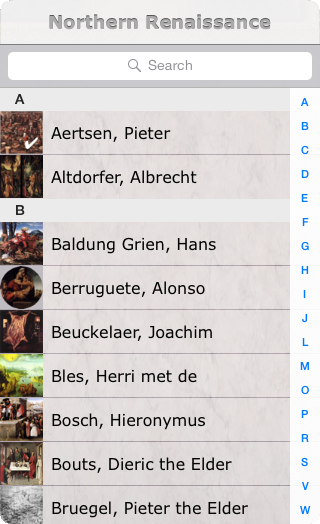 Likewise, by tapping Highlights in the artist list for any major period (Renaissance, Baroque, etc), you can see highlights from just that period. There is also a Highlights button on the sign in each room. Previously downloaded images can be viewed again while offline, with certain limitations. 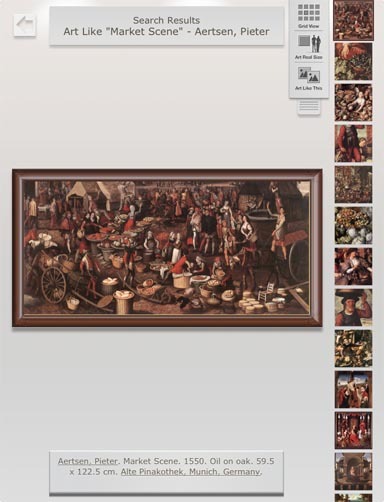 As images are downloaded from the Internet, Art Authority stores them in memory. Stored images can then be viewed while offline. However, the image cache is limited to a certain number of of images, specified in Settings. After that number, images are removed from cache as necessary, starting with those downloaded earliest.